The 1998 inSpirit title. The inSpirit Series was previously known as the Meditation Manual Series. With tired feet I scrunch the pebbles at the shoreline, walking hard, pushing my body at the wind as if I could break through the choices and enter the place of peace. A long tree trunk, white with ocean washing, soft with the long slow tempering of time, beckons my body and I sit, then lie along its narrow surface. And from that prone and precarious balance, I see a tree whose fruit, above the picking line, waits for autumn winds to gather. I see a hedge of foxglove and blueberry, queen anne’s lace and ragwort, audience to the butterfly ballet choreographed by the unseen master of the dance. I hear the triumph song of crickets and the satin swish of ocean-tumbled pebbles and my heart reminds me that God is here, not commanding, judging, threatening, or punishing, but creating a world so wonderful, a prayer so obvious that could I but cease in my fever of petition, I could witness its beauty, too. "Elizabeth Tarbox is an intimate companion but not sentimental, speaking tenderly but plainly and with crystal-clear honesty about things that deeply matter. Large-hearted, fiercely kind, and very brave, Tarbox strides into the gale-force winds of love and loss. These are meditations to restore the soul and bless the day." Combining simplicity of form with sparkling words, Elizabeth Tarbox offers glimpses of the world seen through her eyes—the dawn that “sprinkles absolution,” the tide that moves her deeply as it recedes, the privilege of witnessing vows exchanged between two men. Like miniatures in a fine museum, these are invitations to intimacy with our own unsung lives. 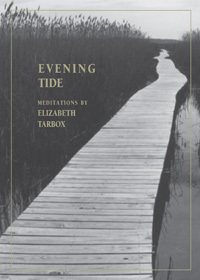 Of the many meditation manuals published since the consolidation of the Unitarians and the Universalists, Elizabeth Tarbox’s Evening Tide stands as one of the most intimate and moving. She serves as a guide to what it means to be a loving, breathing, joyful, and sorrowful part of the universe.